Springtime is right around the corner here in Minnesota! 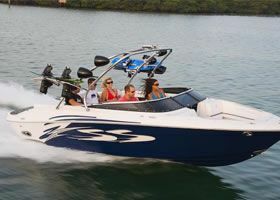 Say goodbye to the bitter cold temperatures and say hello to warmer weather that gives you the urge to get your boat out on the water! However, before you get your boat out on the lake this spring, our Minnesota boat repair experts at Anchor Marine Repair have some boating tips to keep in mind as a spring refresher. Although we do specialize in any boat repairs you may need, we also try to do our best to keep boat lovers from damaging their boat. When it comes to prepping for boating season, we’ve got you covered! Cleaning is a Necessity – Boats should not be a place where you store clutter. If you strive to spend many years with your boat, it is very important to clean up your boat after every trip to the lake. Regular Maintenance – Just like your car, boats need regular maintenance to ensure that the motor and other vital parts of the boat are properly functioning. Anchor Marine Repair offers all of your tune up needs in addition to boat repairs. Keep the Lake Clean – Using environmentally friendly cleaning supplies and ensuring that no trash or tackle finds its way in the water during your boat trip will help keep our beautiful lakes clean. Take care of our lakes in the same way that you take care of your boat so that you’ll be able to continue to spend your weekends out on these waters for decades. Touch up on the Rules – It may have been a while since you last drove a boat. Refresh yourself on the boating rules and etiquette before exploring the lake this spring. Check on Your Boat Trailer – When you are overjoyed with excitement because spring is right around the corner, many people overlook the health of their boat trailer. It is very important to check your boat trailer including its electrical lights and tires, to ensure that it is ready to carry your boat to the lake. At Anchor Marine Repair, we are just as excited about the upcoming spring weather as you are! We have taken into account these spring boating tips on our own personal boats, have you? Enjoy your spring and summer months out on the lakes of Minnesota. Should you need any boat repair or maintenance services, don’t hesitate to give our dedicated staff a call at (763) 972-3540.